The bridge was officially opened on 8 October 1827, but without the presence of the Dukes of Clarence and Sussex, who had turned down the invitation on hearing that a peer of the realm had already been allowed to cross the bridge. Many other important people, including the Duke of Wellington, were also unable to attend, which was a great disappointment to the organisers. However, there was a celebration of sorts, complete with fireworks, and the bridge was declared open when Lord Ellenborough drove over it. The new bridge was a great success and Clark was later commissioned to build similar suspension bridges at Marlow, Buckinghamshire, and Budapest, Hungary, both of which are still in daily use. Budapest’s famous Chain Bridge, though more than double its length, gives a very good idea of what the original Hammersmith Bridge looked like. When he died in 1852, Clark was buried in St Paul’s Church in Hammersmith, and his tomb carries a depiction of Hammersmith Bridge. Later there was a pier for pleasure steamers connected to the downstream side of the southern pier, with stairs down to it from the footway. It operated from 1843 until 1921, when it was removed, as services did not resume after the First World War. 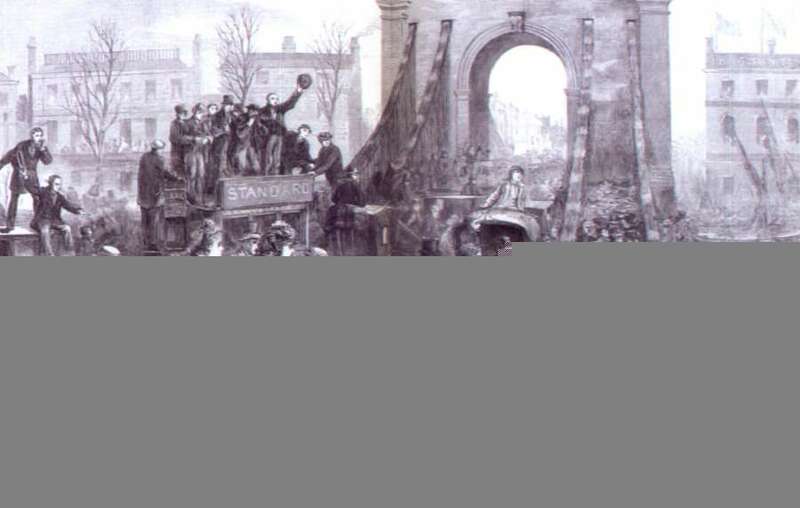 An engraving from the Illustrated London News, showing that even carriages and omnibuses crowded onto Hammersmith Bridge during the University Boat Race. Clark was born in Bristol, where he was apprenticed to a local millwright, and he later went to work at the Coalbrookdale ironworks in Shropshire, where he learnt about the uses and properties of cast and wrought iron; this was to prove very useful to him in his later career. In 1808 John Rennie visited the works and was so impressed by Clark’s abilities that he offered him a job at his Albion Works in London. In 1811, on Rennie’s recommendation, he was offered the post of engineer at the West Middlesex Waterworks, which supplied water to Hammersmith, which was then only a small village. He was to stay with them for the rest of his life, making many improvements. His new employers allowed him to work for other companies also, and he went on to design the first Hammersmith Bridge, which was the first suspension bridge over the Thames. He designed other bridges as well, including the suspension bridge at Marlow and his most famous construction, the Chain Bridge in Budapest. After a visit to London by a Hungarian delegation, he was invited to design the new bridge, which would be the first permanent bridge between Buda and Pest. As he was busy on other projects, the construction, which lasted ten years, was supervised by Adam Clark, who was not related to him. The Hungarians have always been very proud of the bridge, and both Clarks had streets named after them. Although damaged in the Second World War, it was rebuilt and still stands as a symbol of the city. 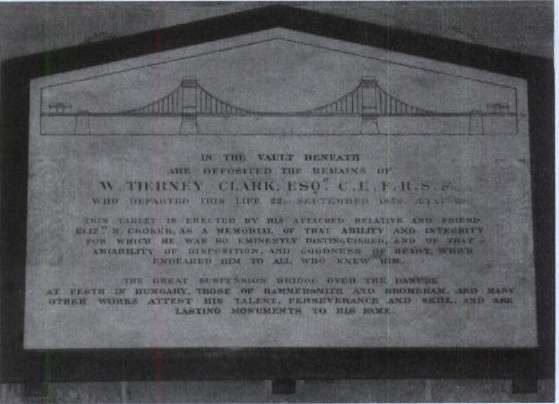 The memorial to William Tierney Clark in St Paul’s Church, Hammersmith, with a depiction of Hammersmith Bridge. Clark designed a suspension bridge to cross the Neva in St Petersburg, Russia. It was never built but earned him a medal from the Tsar in 1845. He was also associated with various railway schemes and was consulted on Brunel’s Thames Tunnel. He was an early member of the Institution of Civil Engineers and was also a Fellow of the Royal Society. He is not as well known today as many of his contemporaries, but he was very well regarded by his fellow engineers. He died at his home in Hammersmith and is buried in St Paul’s Church there, where his memorial bears not a bust of himself, but a relief of Hammersmith Bridge.